This is wonderful. And somehow it's so beautiful and mournful it actually makes me sad (in a good way). All those gentle blues and greys fit the mood so well, and the wind-blown movement of the hair contrasts so beautifully with the stillness of his face. I'm clicking on watch as I need to look through your gallery at leisure, your art is superb. 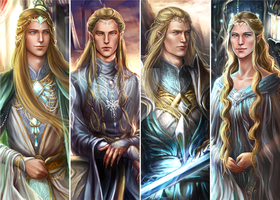 The best of the sons of Fëanor. The only sane among Feanor's children. Well, Maedhros was pretty sane - he was the one who tried (and mostly succeeded) in controlling his brothers, keeping them on the right-hand path, insofar as that was possible. I think he only really cracked towards the end. But yeah, it's bloody gorgeous. I love this so much for the gloomy seaside atmosphere..I can feel the strong cold wind on my skin just by looking at this painting.. the melody of the harp plays beautiful symphony with the sea waves.. his flying hair is in harmony with sea too.. like waves.. the expression of his face is just magical for the moment..everything together is making this piece so exquisite and sensational! You are so wonderful about the atmosphere, just amazing! This is very good. I love how you depicted him with loosened hair and with a grey background, showing his sadness and desperation. Well done! This is wonderful. Do you sell prints? you are so talented! awesome. When reading the Silmarillion, I got chills when it said that the last of Feanor's sons still roamed the shores of Middle Earth looking out to Aman. Your work just gave me the same emotions. Brilliant. Love the limited palette..it adds to the somber mood. Really wonderful! When, Maglor, when will your pining end? When will this sad song turn to blissful silence? When will you find peace again? The Detail on the Harp in this image, watercolor, Astounding!! If I had to choose just one artwork of a Tolkien character, it would be your depiction of Maglor. This is beautiful beyond words! Beautiful and sad... absolutely amazing artwork! One of the best, if not THE best, paintings of Maglor that I've seen. Incredible work! Absolutely love it. To get this much beauty from watercolor, I never could have imagined it was possible. Your work is dazzling, and stunning. Beautiful. Have you seen any of Mikhail Vrubel's work? This reminds me of his portraits - which is intended as a compliment.